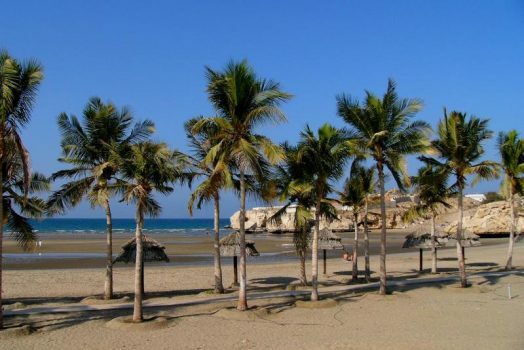 Reward your staff with an incentive trip to Oman! Transport your guests to a seemingly bygone era in this land of vast natural beauty and vibrant culture. Direct flights from the UK to Muscat only take around 7 hours and depart from several regional airports. Therefore, Oman is an accessible as well as fascinating incentive destination. Throughout this remarkable incentive, staff will discover a world and culture significantly different to their own. Once you arrive in Muscat, you’ll see how Oman elegantly combines tradition and modernity. The city is without utilitarian high-rises and tower blocks. Furthermore, even the functional buildings feature ornate domes or arabesque windows. The whimsical appearance transports you into a fantasy world, perhaps akin to that of A Thousand and One Nights. Venture out to discover Oman’s dramatic landscapes. Savagely beautiful wind-blown dunes stretch over vast expanses. Craggy canyons cut into the face of imposing mountain ranges. Although this harsh landscape seems unending, it relents to oases where date plantations which sprawl along valleys. There, the sparkling wadis invite you to plunge into their deep aquamarine waters. Oman offers wide range of fascinating excursions. Perhaps travel along dusty roads to towering forts or explore the vast oceans of sand dunes. Experiencing this wildly different land is sure to help your team gain new perspective and create a strong shared memory. Additionally, evenings will be anything but dull. Perhaps head to the opera for a taste of classic Omani culture – a once in a lifetime experience. Enjoy a traditional meal as belly-dancers sashay and sway or dine under the stars in the Bedouin way. 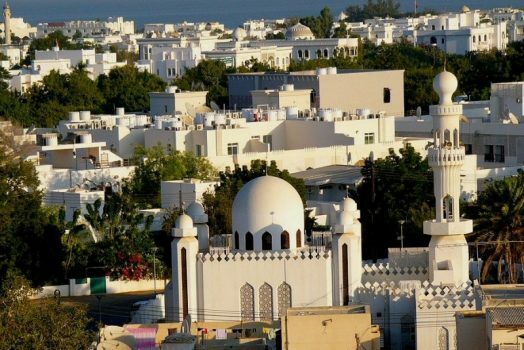 Get to know the capital city of the Sultanate of Oman. Muscat offers the visitor a unique opportunity to witness the harmonious existence of a modern commercial centre and traditional culture. With its natural harbor, Muscat means ‘Anchorage’ and lies in natural volcanic bowl.Tour the glorious Grand Mosque (except Friday) and Bait Al Zubair Museum (except Friday) to uncover the country’s rich history and its development. Visit the lively fish market at the waterfront and then continue to the vibrant and colourful Muttrah Souq. Indulge in fun filled shopping, bartering with local shopkeepers selling traditional creations made of copper, camel bone, leather and silver. 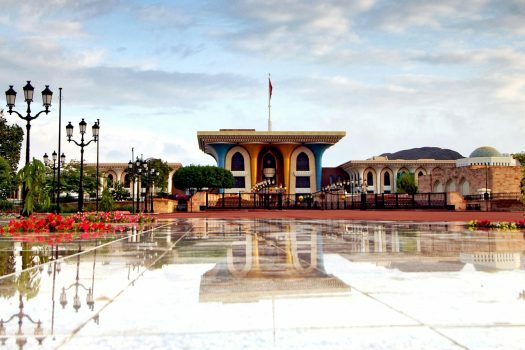 See the majestic Al Alam Palace, an official palace of his Majesty Sultan Qaboos bin Said, which is flanked by two 16th century Portugese forts – Mirani and Jalali. Dress code: Long sleeves and full-length trousers for men and women. Ladies to be fully covered with scarf. With dunes rising up to 200 metres, the Wahiba Sands are a vast sea of undulating red and white sand. Famed for their natural beauty, this wilderness is home to a myriad of flora and fauna. Capture some photos of the ever-changing sand patterns. Enjoy lunch is this awe-inspiring place before continuing to Wadi Bani Khalid which contrasts this landscape strongly. There, swim in the deep blue waters of Wadi Bani Khalid. It encompasses small pretty villages embedded in the mountains. Stop for coffee at the home of a Bedouin tribe family known for their hospitality and knowledge of the sands. It is advisable to wear light comfortable clothing and walking shoes. Transfer to Muscat’s marina to board a boat. 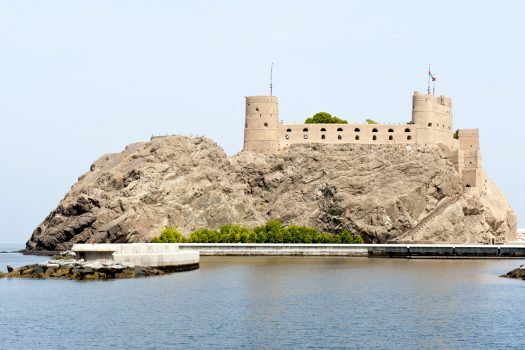 On this adventure, explore the beauty of Muscat’s rugged coastline. Watching wild dolphins is a thrilling way to start the day. Many species of Whale can also be found off Muscat’s coast so you may be fortunate enough to see them too! Perhaps dock at a tranquil island to enjoy a BBQ lunch and activities which could include jet skiing and snorkelling. 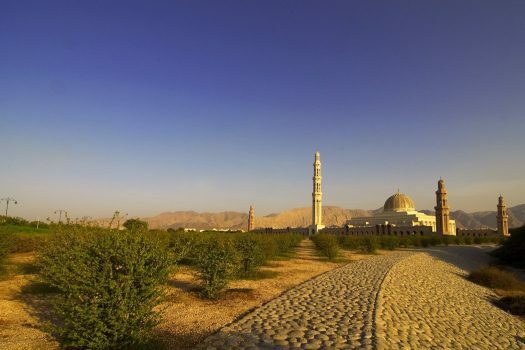 Follow the dusty road to Nizwa, which was the ancient capital of Oman. 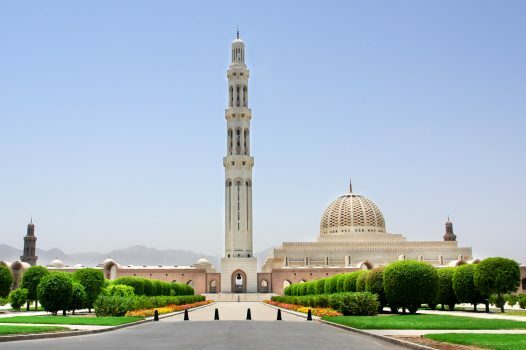 The birthplace of culture, tradition and Islam is Oman, it features an impressive 17th century round tower designed to withstand the vibrations of 24 cannons. For a special experience, perhaps enjoy lunch in the fort. Visit the souq known for its silver jewellery, khanjars – daggers featuring intricate hand-carved designs, and its cattle auction on Fridays. Close by is the Jabrin Castle, the finest and most elegant example of traditional Omani architecture. It boasts excellent Omani ceiling painting and beautiful, detailed woodcarvings. Returning to Muscat, visit the pretty village of Birkat Al Mauz situated at the foothills of Jebel al Akhdar (Green Mountain). Why not enjoy a walk through this oasis with its dense date plantations? On this fascinating and varied excursion, we head through mountain terrain and through quaint fishing villages to Quriyat Fort. This 400 year old fort stands in a town with the ominous honour of being one of the first towns sacked by the Portuguese. Visit the fish souk to see a variety of fish bring traded for local consumption as well as export. Travel along the scenic waterfront, stopping at an inland stream for the opportunity to see birds including eagles and flamingos. Continue along the coast to Bimah Sinhole – a spectacular limestone crater with blue green water at the bottom. We then start on an adventurous route cutting through the mountains to Wadi Arbayeen. In this oasis, deep turquoise pools of water are set among date palms. Enjoy a picnic in this blissful spot. There are many different evening activities to delight your staff. Allow them to relax and unwind immersed in Omani culture. Treat your staff to an elegant evening of passionate music and theatre provided by internationally renowned stars. This is sure to be an unforgettable experience. Visit a restaurant which transports guests to Oman of old. In its open air, candle lit courtyard, relax and enjoy a Bedouin style evening under the stars. Propped by a variety of cushions and throws, dine on traditional kebabs and try a fruity shisha pipe. This is a wonderful way for your staff to unwind in a traditional setting. Celebrate the end of your incentive break in Oman with a farewell evening, bursting with traditional Omani hospitality. Relax on richly woven carpets and colourful cushions and feast on the finest Omani food while belly dancers sashay to the rhythm of the traditional drummer music.